Smangtasia is a place and a feeling that we have designed to open your mindhole. Do what you want as long as you are respectful of one another. Zero tolerance policy for acting a fool. Attendees are invited to camp as part of admission. What's the food and refreshment situation? Food vendors will offer delicious vegan, vegetarian, and meat options all weekend long. There will be a bar with ample refreshments. What's the bathroom and shower situation? Bathrooms with running water and showers are freely available. 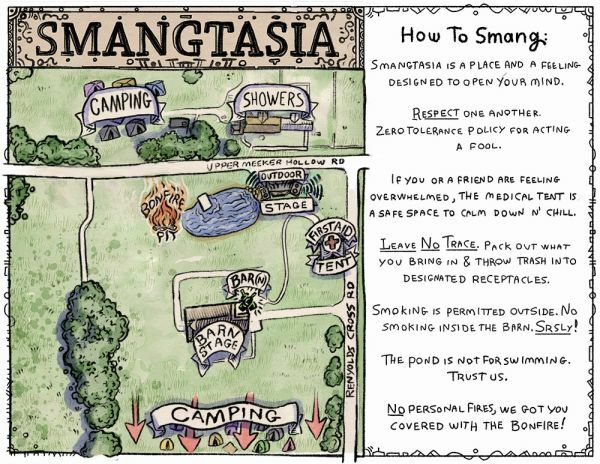 How do I get there and what is the timeframe for Smangtasia? The site is accessible by car and we will charter busses from Brooklyn for those who cannot drive. The action takes place Friday afternoon through Sunday evening, but those in cars are encouraged to rest up at camp one final night for a departure back to reality on Monday morning. I plan to bring my own camping gear what should I bring? I'm unable to bring my own camping gear is there an option for me? We will be offering presetup camping packages for those that just want to show up and boogie. Available as an ad-on on RA. What should I do if I feel unsafe or need help? The team strives to maintain an environment in which everyone feels safe. Please look after one another and If you feel uncomfortable for any reason report to a staff member. Security will be visibly present outside each stage and they are there to help you with any and all bad vibes. If you or someone is feeling overwhelmed the medical tent is a safe space to calm down n’ chill. Can I smoke at Smangtasia? No smoking inside the barn. Serious fire hazard. Smoking is permitted outside and anywhere on the grounds that is not enclosed. Please dispose of your butts properly. Please show your respect for the venue and staff by cleaning up after yourselves and throwing your trash into the many designated receptacles throughout the grounds. How can I get in touch about Smangtasia? At Smangtasia we encourage you to do your own thang as long as you are respectful of one another. No grilling / fires / fireworks allowed on the grounds or campsite. No Weapons. No illegal substances allowed. No breaking the law. Word.